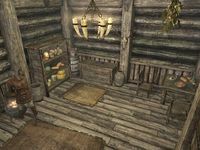 The stables are just to the right of the main gate into Riften, with space for two horses in separate stalls. There is an empty cart and three barrels, two of which contain food and the third is a fish barrel that can contain raw salmon meat fillets, various small ingredient fish, clam meat and salt piles. 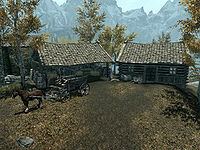 To the right of the stables, among some trees is where a Khajiit Caravan lead by Ahkari camp when they are at Riften. There is also a gourd plant among the same trees and behind the stables towards the rear exit for Honeyide is a canis root plant near some rocks. There is also a carriage in front of the stables driven by Sigaar, who is willing to take you to any of the main cities and towns. Esta página foi modificada pela última vez à(s) 16h03min de 21 de fevereiro de 2016.